It’s not unusual for me to shoot motion blurred trains coming into a station. I’ve made this kind of image many times. But, I persist, since I like motion blur and I like trains. 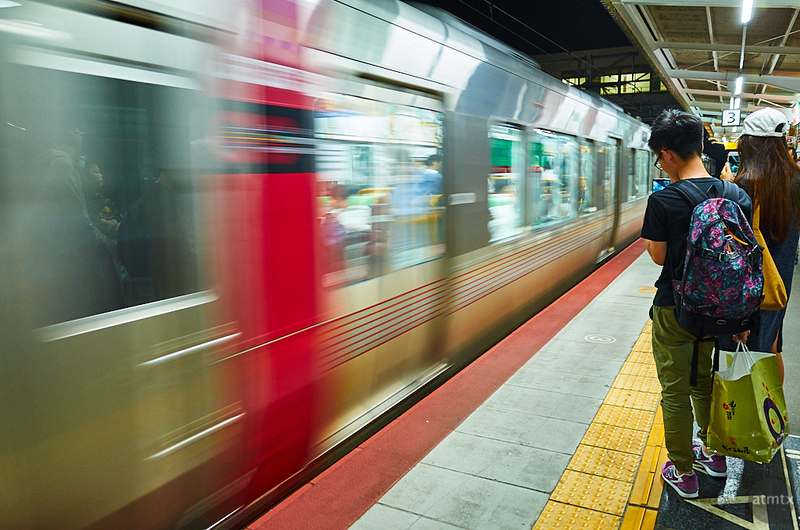 I probably shot this at Miyajimaguchi Station, which is the closest station to the ferry that goes to Miyajima. I was on my way back to downtown Hiroshima, for some urban night photography. This blurred train has a particularly nice red stripe, which pops against the silver. What I didn’t realize was the two folks in the frame were also photographing. I guess I’m not the only one liking these kind of shots. With a smartphone, however, I’m pretty sure they didn’t create a motion blur. Upon checking the EXIF, I was a little surprised I shot this with my compact Ricoh GR, instead of the Olympus. As you know, the Olympus has wonderful in-body image stabilization. The Ricoh GR has none. That said, I was shooting at 1/20 of a second, which is not too slow at a 28mm equivalent focal length. I’ve gotten steadier at hand-holding, out of necessity with the GR, getting about a stop of stabilization, if I’m lucky.